Mediator of cell adhesion and migration. 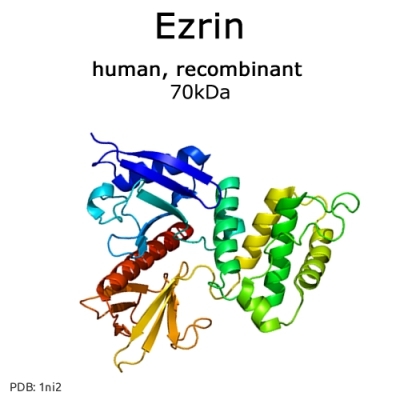 Ezrin is probably involved in connecting the cytoskeleton to the plasma membrane. In epithelial cells. It is required for the formation of microvilli and membrane ruffles on the apical pole. membrane. Like many proteins. Ezrin is autoinhibited by a head-tail interaction. The C-ter binds to actin. PlP2 and membrane proteins, e.g. CD44. with 50 µl ultrapure water to obtain a 1.0 mg/ml solution. Purity:>96% by scanning densitometry from Coomassie G-250 stained SDS-Gels.